I first came to Greece over 20 years ago. Then, as now, I find blissful joy in wandering aimlessly, exploring, and taking photos of the white-washed houses, staircases and doorways, flower pots, turquoise domed-churches, and the food of course! Seeking out authentic food is my most passionate mission of all. The stunning white villages against the striking blue Aegean Sea provide a magnificent backdrop from which to begin a journey of discovery ~ our history, Greek food, culture and tradition. We start this journey at the base of the ancient high city, and watch history unfold as we enter the time capsule. The view of Athens as seen from roof-top restaurants, and the Acropolis high above, is simply magnificent ~ a sprawling, yet picturesque undulating city surrounded by rolling hills, gradually flattening out into the sparkling blue sea. A rejuvenating stay on the Cycladic islands of Santorini and Sifnos is following by an exciting stay in the heart of Athens. Greece has six groupings of islands, plus Crete and mainland Greece. The choice is utterly overwhelming, and all are wonderful and interesting in their own right. Why the Cyclades? With their dazzling white-washed houses, twisting cobbled alleyways, blue-domed churches, hilltop windmills, and stunning beaches, the Cycladic islands offer the quintessential Greek island experience, they are everyone’s image of the perfect Greek island. 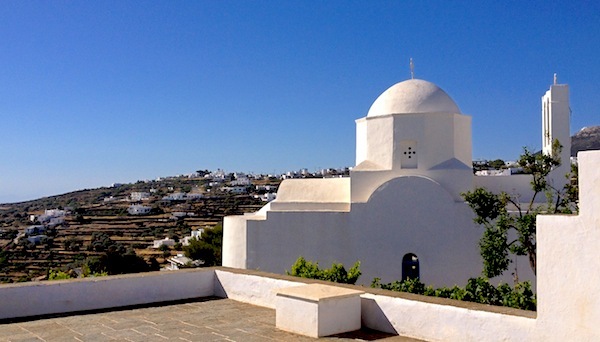 Santorini simply cannot be missed, and Sifnos is charming & quaint. For more information, visit our daily itinerary description. Includes: 13 nights lodging in beautiful, high quality accommodations (4 nights in Santorini, 5 nights in Sifnos, 4 nights in Athens), 8 breakfasts, 5 lunches, 6 dinners, airport and port pick-up & return (roundtrip taxi transfers between airport/port and Athens hotel), rental vehicles on Santorini & Sifnos, full auto insurance, fuel, tolls and parking, domestic ferries to/from Greek islands, privately guided tours & visits, customized food & restaurant itinerary in Athens, carbon offsets for international flight, and all highlights listed above. LAND PACKAGE ONLY. Excludes: International flight (arriving in Santorini, departing from Athens), transportation/taxis other than specified above, tips for guides, and mandatory comprehensive trip insurance. Activity level: STRENUOUS – This tour involves a lot of walking, standing, stairs, hills, cobblestones, and gravel pathways. Note on travel style: My focus on well-being affords you an itinerary with a slow start to offset the stresses of travel, a comfortable sight-seeing pace, periodic downtime, attention to healthful practices, such as balanced meals, fresh vegetables, and the option to attend a yoga class. Travelers with food sensitivities or allergies may be accommodated, please inform me upon booking. Tour limited to 8 travelers; reservations honored on a first come, first served basis. This is a LAND package beginning in Santorini, Greece (airport code: JTR) and ending in Athens, Greece (airport code: ATH); price does not include airfare. – Outbound flight: Due to overnight flight, you will need to depart one day prior to desired arrival in Greece. Please aim to arrive Santorini between 3:00-6:00pm, if possible. – Inbound flight: You will depart Athens and arrives USA same day. Check-out is 10:00am. Please book flight to depart no later than 2:00pm. You have the option to arrive Athens a day early at your own expense. Please note that domestic ferries have been budgeted at current market prices, and if the price increases, you agree to pay the amount of the increase (i.e. ferry from Santorini to Sifnos, and ferry from Sifnos to Athens).